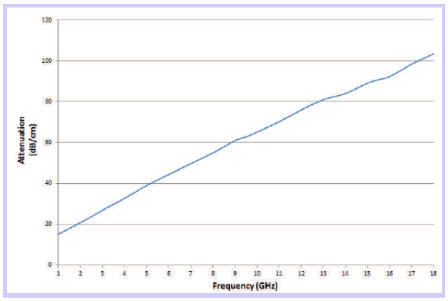 MAJR Products 6504 RF High Frequency Absorber silicone-based material performs in frequency ranges of 1 to 20 GHz. It is thin and highly flexible, non-conductive, corrosion resistant and is UL-94VO flame rated and RoHS compliant. Because this is a magnetically loaded material, this high frequency microwave absorber dampens electronic cavity resonances, reducing EMI emissions, crosstalk, back reflections and antenna side lobes. MAJR can supply all of your RF microwave absorber needs. Ask for samples and talk to us about your unique project requirements! M6504 has generous attenuation levels across frequencies, making it suitable for cellular and telecom applications along with military uses. It is used, for example, for reductions in radar cross sections, in RFID tag and reader antenna systems, oscillators and amplifiers, GPS systems, digital camera equipment and aeronautical devices. It is flexible enough to fit and adhere to tight or irregular spaces, and for non-conductive cases a metal backing tape can be applied to increase absorption effectiveness. It is tough enough to stand up to outdoor environments and has a working temperature range of -60º F to +375º F.
MAJR’s RF High Frequency Microwave Absorber material comes in sheets or on rolls, or we can produce die-cuts quickly to your exact specifications and shapes. You can also order the material without or with pressure sensitive adhesive on one or both sides. Download the Data Sheet for our RF High Frequency Microwave material for more specifics. Don’t forget to consider our shielding tapes and gasketing materials to complete your enclosure.